In 1960 with a friend I traveled to Poland, the Soviet Union, and Hungary. 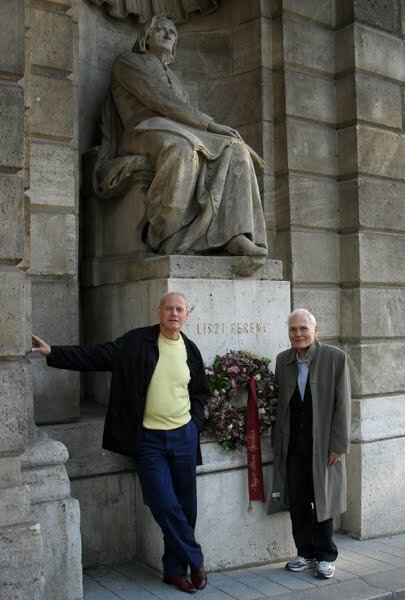 In Budapest, at a performance of Tristan und Isolde, sung in Hungarian, we sat next to one Dr. Arthur Sibelka and his wife. They introduced themselves to us and sought to speak with us in a private place after the opera where the secret police could not hear us talking. They asked us many questions about the state of the world. He had been an official in the government in Hungary before the Communist takeover in 1947 and afterwards was made to work in the fields in Eastern Hungary. After six years of hard labor he had come back to Budapest and had several years of peace, working in a small position in the Department of Agriculture prior to supporting the ill-fated Nagy government in the eight-day revolution in 1956. He was able to go back to his position after the Soviets crushed the revolution and worked there until he retired. He passed away in 1981. 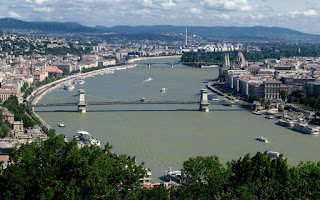 A year or so ago, I mentioned my connection to Dr. Sibelka--with whom I had had no further contact--to a Hungarian friend in Seattle who has many contacts here in Hungary. Before long I received an e-mail from György Sibelka, nephew of the man I met in 1960. Today in Budapest, Mr. Sibelka met me at the train along with his two daughters, Agnes and Zsohphia. 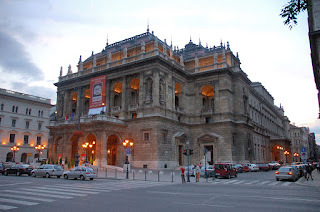 The Sibelkas took me first for photos at the opera house, then on the first underground railway created in Central Europe (1898) to a beautiful restaurant by the Danube. The water actually looked blue today as there was not a cloud in the sky. We had traditional Hungarian food: goulash soup and a huge plate of stuffed cabbage with sour cream, slices of veal and a sausage. György regaled me with stories of his uncle and of his family in general. His grandfather had four wives, so the Dr. Sibelka I met was a half-uncle of his. The grandfather apparently was very successful and lived a very cosmopolitan and exciting life. Dr. Sibelka, on the other hand, was more intellectual and worked very hard his whole life. György told me how much the six years in Eastern Hungary, working as a laborer, had cost this man of letters, who had traveled and worked for the short-lived postwar Hungarian government in Italy and in other countries in Western Europe. His stories neatly fit into my recollection of the conversations of a half-century ago. When Dr. Sibelka asked me, “How is Florence?” I said, “What do you mean?” He said, “Well, my wife used to go to Italy often, and now we can’t. I just wondered if it is the same. Tell me how it looks.” It moved me greatly and does now. Here was this cultured European denied the right to travel because of a totalitarian government and forced to work as a field hand just because he had been a member of a democratic government. When we finished that very large meal--I ate more today than I have in the previous two weeks in Europe--we walked about 100 yards to the Cukaraszda Confectionery, an extremely popular restaurant in Budapest that, like many places in Vienna, only serves desserts. 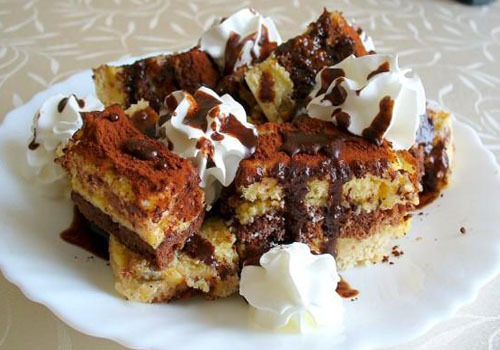 We ate a marvelous concoction of cake soaked in rum, plus whipped cream and chocolate called Somlói galuska. I heard more stories about their family. His eldest daughter, Agnes, spoke very good English and had worked in Canada for a business firm for which she later worked in Hungary. At the moment she is taking care of her two children, a boy and a girl, six and ten. His other daughter, Zsophia, is not married and also lives and works in Budapest. György speaks hesitant but very expressive English, and he worked at it all afternoon. When it was over, they took me back to my hotel. It was a great experience, particularly because my wife’s mother was Hungarian, and on this day I became much closer to her background as well. Now it’s on to a very un-Hungarian opera, Rossini’s Cenerentola --we call her Cinderella, and the Hungarian name is "Hamupipőke". Speight has such a way with words - as well as with opera. I enjoyed reading this account, along with its photos of food. I agree and enjoyed reading as well. Mr. Speight wrote such an interesting story for me! It has to be very nice to see and meet Dr. Sibelka´s relatives after long time! It looks like a movie story screenplay. Anyway visiting Hungary seems to be a good idea also because of its cuisine! Awesome service from these guys. Very fast pavement sign print job and they had is run a pre inspection to make sure everything was alright with me. They took the time to give me instruction on how to properly apply the Jansen display.